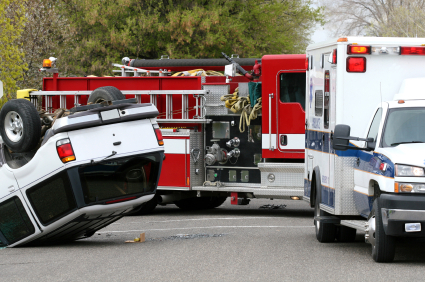 A rollover accident occurs when the car turns over onto to its side or roof. Statistics compiled by the National Highway Traffic Administration (NHTSA) show that more than 280,000 rollover accidents occur every year. Of these 280,000 vehicular rollovers, approximately 10,000 are fatal. Most of these collisions occur during the morning, mid-day and early evenings as these time slots are the peak hours for traffic. A rollover is commonly a single vehicle accident; although rollovers can occur in multi-vehicle accidents when a vehicle is side-swiped or side impact. While there are several causes of rollovers, all of the causes of rollovers have one common denominator: vehicle stability. When we mention vehicle stability, we are referring to the interplay between the vehicle’s center of gravity (i.e., the point at which all of the weight of an object is concentrated) and the vehicle’s track width (i.e., the distance between the left wheel and the right wheel. For example, compare the Porsche Carrera automobile to the ex-football star Barry Sanders. Both are low to the ground and have a low center of gravity. Additionally, both have a wide track (relative to their size) and are able to turn or change direction at a moments notice without tipping or falling over. However, when a vehicle’s center of gravity is high—like you’ll find in a sports utility vehicle (SUV)—and the road is fairly narrow—similar to a sharp or fast turn (a cause of rollovers), the SUV or vehicle could unfortunately tip or roll over. Another cause of rollovers is tripping. Tripping in the vehicular sense is much like the physical act of pushing and tripping a person’s foot to the side at the same time. On the road, tripping occurs when a vehicle slides or move sideways (as from a side swipe or side impact), thereby causing the car to either hit a stationary object, such as a curb, or suddenly gain traction. The gaining of traction generates immediate lateral force, which causes the vehicle to “trip” or rollover. Yet another cause of rollovers is when a vehicle collides with another vehicle, such as a side impact collision, or when a vehicle strikes an object causing the tires resist the change of force; ultimately, then, the vehicle flips. What’s more, a rollover can also be caused when a car drives over a ditch or a slope causing the vehicle to rollover. All vehicles have some susceptibility to rollovers. However, a majority of the rollovers occur in SUVs and four-wheel pickup trucks. This is partly due to the distance between the road and the bottom of the vehicle. In other words, these vehicles have a high center of gravity. On occasion, these vehicles are also carrying a load which can make them top-heavy and susceptible to a rollover. Rollover crashes are particularly dangerous when compared to a front, side or rear impact crash because the roof of a vehicle is crushed, which can lead to brain or head injuries. The crashworthiness of a vehicle is the ability of a vehicle to protect and shield its occupants from danger and injuries in a car collision. It is well-established that auto manufacturers have a duty to motorists and passengers alike to build reliable cars that take into consideration evolving technology, vehicle design and safety. In some rollover cases, it can be shown that a vehicle manufacturer was negligent in the design of the vehicle and that this defect contributed to the injuries sustained by the occupants. In such cases, an experienced lawyer can prove that a design feature increased the risk of injury or could have been reasonably avoided. If you or a loved one has been the victim of a rollover accident in the state of Georgia, then the Law Offices of Kevin C. Ford can help steer you through the legal maze; investigate the cause of the rollover; evaluate the design of the vehicle; and help you achieve a judicious result. It is important that you contact an experienced car collision attorney quickly to preserve evidence from the roadway, vehicles and witnesses before the evidence is lost or destroyed. The Law Offices of Kevin C. Ford is currently accepted rollover accident and crashworthiness cases throughout Georgia. Please contact us today for a no risk consultation to discuss your case in detail. Our office will cover the costs of pursuing your case and if there is no recovery, then there is no fee.